DUBAI: Shaikh Hamdan Bin Mohammad Bin Rashid Al Maktoum, Crown Prince of Dubai and Chairman of Dubai Executive Council, praised the efforts of Dubai’s Roads and Transport Authority, RTA, in carrying out a series of projects related to Artificial Intelligence, AI, autonomous mobility, and shared mobility/transport. Shaikh Hamdan made these remarks during a visit to the Metro Depot at Al Rashidiya, where he was received by Mattar Al Tayer, director-general and chairman of the Board of Executive Directors of the RTA. 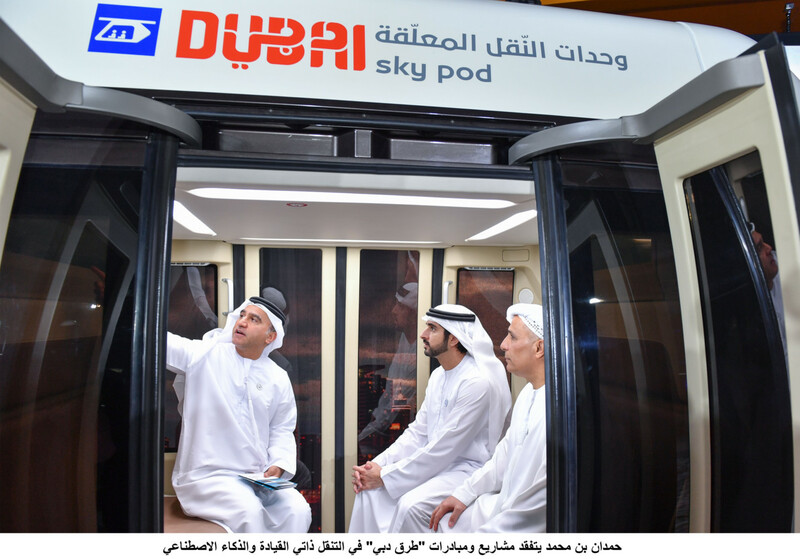 Shaikh Hamdan inspected two models of Dubai Sky pods - a futuristic mobility system in the Dubai Emirate. Characterised by using an area of land that is 100 times less than conventional means of the same capacity, the pods’ power efficiency is five times less than electric vehicles and the system requires infrastructure, which is ten times less than conventional transit systems of the same capacity. The second model is the Unicar. It is designed to carry passengers for a distance up to 200 kilometres. These units have a stylish design and conform to Dubai’s global standards. 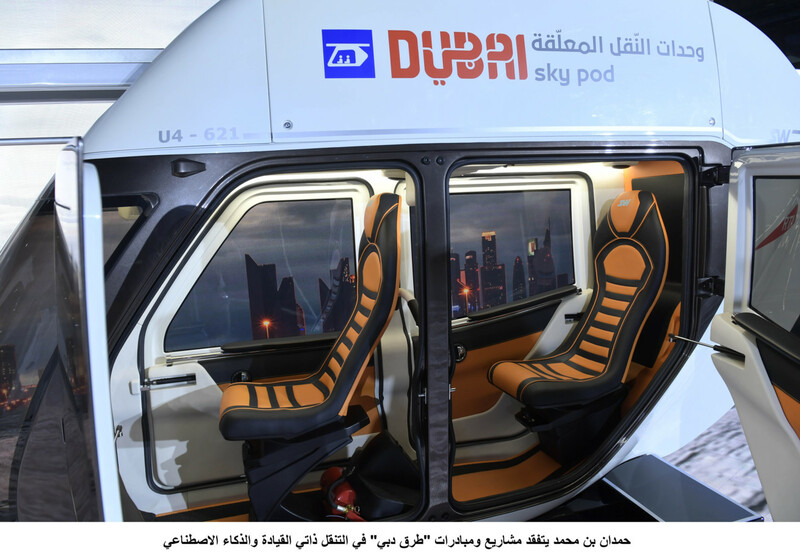 The unit can accommodate one to six riders and travel at a maximum speed of 150 km/h. The network can transport about 50,000 riders per hour. 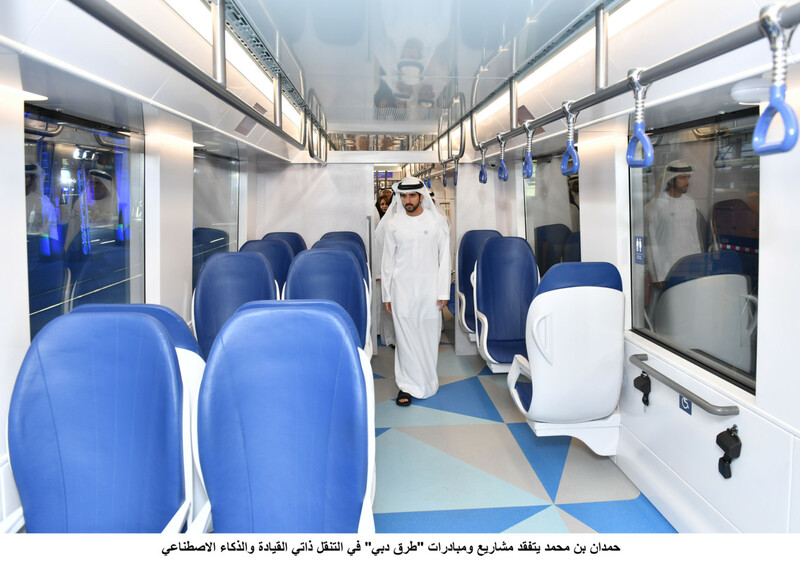 Shaikh Hamdan also inspected the new train of the Dubai Metro which has recently arrived and is being tested at the depot. He checked the additions and improvements made to the interior of the metro carriages such as dedicating the last carriage to women and children and leaving part of the first carriage for the Gold Class. Other carriages were designated as Silver Class. The Dubai Crown Prince also inspected the world’s latest rail maintenance system. A grinding machine automatically restores worn tracks, and realigns the rail tracks with the train wheels and thus eliminates the risk of rail breaking. 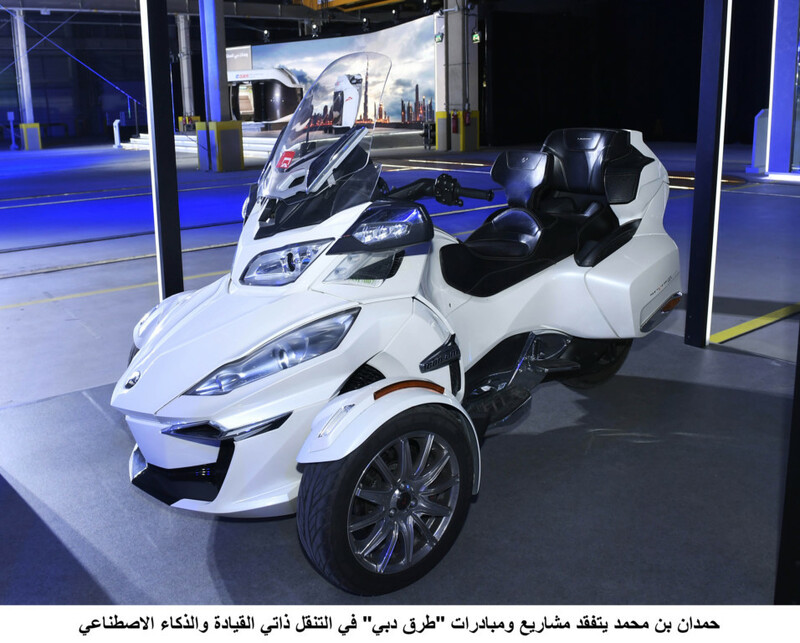 Shaikh Hamdan inspected the Range Rover Evoque convertible limo and the Dubai Taxi limo bike. The convertible limo offers a unique mobility experience befitting the luxury of Dubai. The Limo Bike offers riders and tourists an exceptional mobility experience, especially in winter, besides being a practical solution during peak hours at high-population density areas. He also inspected the Mobile Command Vehicle in support of roads and transport-related emergency and crises. The vehicle is fitted with cutting-edge technologies such as wireless connection with the Enterprise Command and Control Centre, EC3, and satellite connectivity enabling direct transmission to the centre from the site. 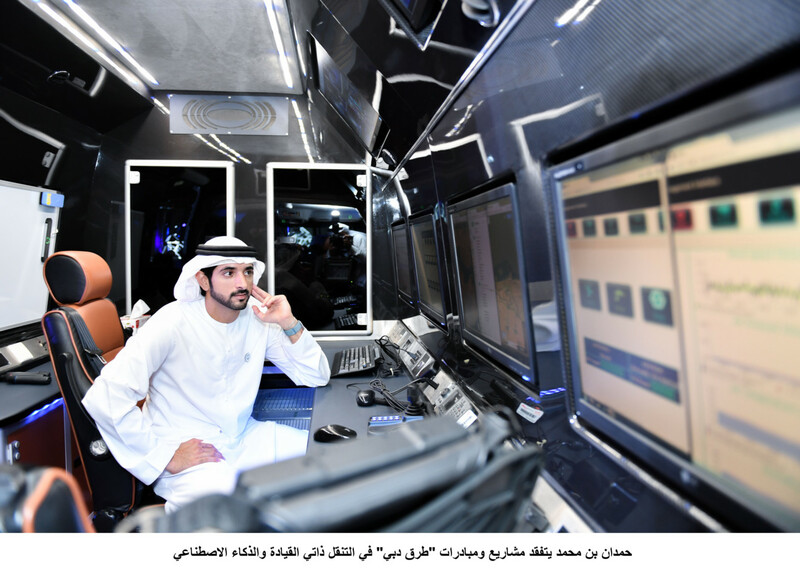 Shaikh Hamdan was also briefed on RTA’s AI experience highlighted by Dubai Metro, the world’s longest driverless metro. The use of AI in the Dubai Metro fully automated operation covers automated journey planning, lines signalling system to enhance security, and risk prevention, such as the collision, while enabling trains to travel at maximum speed. This system has reduced operational costs by seven percent and improved punctuality by 6.4 per cent. The Crown Prince attended a presentation highlighting RTA’s efforts in operating the autonomous air taxi. The technical specifications are currently being set after finishing the assessment of air taxi manufacturers. He was also briefed on the progress of preparations for the Dubai World Challenge for the Self-Driving Transport Congress, which aims to showcase the leading role of Dubai Government in self-driving mobility. The Challenge covers three pillars: self-driving vehicles integrated with public transport; self-driving vehicles used for transporting passengers within certain zones; and self-driving vehicles that link parking lots with entrances of destinations. The RTA has already started receiving applications for participation since February 2018. The names of those qualified for the Challenge finals were announced last October, and the winners will be honoured in October 2019.